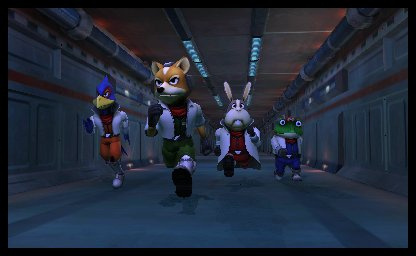 You probably heard the cheers when Nintendo's on-stage demo of Star Fox 64 3D featured the immortal words "do a barrel roll!". Expect similar cheers now Nintendo has announced a release date of 11th September 2011 for the game. Nintendo also sent over the latest trailer for the game, which should get you into the spirit of the series — "it's a trap!" and so on — as well as showing off the new multiplayer mode that uses the 3DS's camera to show a live video feed of players so you can enjoy their grimaces as you destroy them all. What about Europe? We watch E3 too, and we like games. Maybe NoE have overslept. Still no E3 trailers on our eShop. It's been out a day and already NoE are screwing it up. Anyway. I look forward to SF643D. Good news. But yeah, what about us EU-ites? Not sure I'm going to get this yet. That's so awesome, just a few months away! Day one purchase for me. Love the camera feed when you play online, nice little touch. @4, There is no online brudda. Yeah, releasing on 9/11 doesn't seem wise. I wouldn't be surprised if Nintendo revise this. It's weird because you can tell the voice actors are the same (or are at least sound alikes) but they still sound slightly off. I know I'm not the only one who has memorized every line of Star Fox 64, so I can't be the only one feeling this way. Ah well, I probably won't even notice when I'm playing the final product. I dont think that a "space shooter / Flying game with animals as pilots would cause much trouble if released on 9/11. But im not quite sure, soes it have online MP or is it just local ? Perhaps you should consider changing the title of this article a little bit or is that just me? dope , now if they could just make a star fox for the wii u mmo with classes and let you be able to make clans. have rob tune in and let you know when your rival clan has entered your airspace lol im getting ahead of myself that still that would be awesome and let you be able to make your own character with certain custom features. star fox is a classic. so is that 3ds multiplayer online ? Yeah, Nintendo, release a game about destructive space planes that can crash into buildings 10 years after 9/11? Real smart. I think they should have it launch one week earlier or later. Downloaded the E3 video on the 3DS and wow it looks freaking awesome in 3D! Can't wait. Some people have said this game has no online. That's 1/2 true, as far as I'm aware only local wireless has been confirmed, but online hasn't been denied. Not having online would be a big mistake. Also the 9/11 complaints. Would you have it that 9/11 be forever a date where nothing is allowed to be released or done because some people find a round about reason about how it hurts their feelings? I CAN'T DECIDE! Should I get this, Super Mario, or Mario Kart? I should trade in lego starwars cause it looks completely s*cky compared to these! A:Hmm, what day should we release SF64 in the US? B:Well, we could release it on 9/11, so all Americans feel bad when they buy a flying game on a day when thousands of people died because of a plane! A:YOU'RE A GENIUS LET'S SCREW OVER THOSE AMERCIAN GAMERS!!! It sounds like they improved the audio quality of the voices to boot. Happy about that. Wow releasing a Flight game where you shoot down other aircraft on the 10th anniversary of 9/11? Nintendo should rethink their release date of that game. @24 you got a point. This one looks decent. the facecam could use a better framerate though. I haven't played this gem nearly as much as Zelda:OoT so I'm much more excited for this. It looks like the presentation has been beefed up for the multiplayer, along with video... chat? (Or just live video?). Hopefully the Multiplayer is simple and similar to SFC but not too involved like SF Assault (though I liked Assault). Anyway, this is an instabuy for me. Sunday? That means my local Target won't sell it until Tuesday because they're idiots like that. People are upset that a space shooter starring a fox, rabbit, falcon, and frog who defend a galaxy from an evil monkey in their awesome fighter jets is being released on a Sunday which happens to be September 11? lol people osama bin laden is dead and come on there have been soon 11 years since it happend it will not happen again dont hate nintendo because of it . @28 It's a date that should be a holiday, honestly. And since it's the 10th 9/11 since the attack... I don't think releasing it on 9/11 is a good idea just because some people might not appreciate it. But honestly, it's not that huge of a deal. Oh, I guess that date isn't particularly significant for me, to be honest. I was halfway through the comments before it hit me. I suppose I haven't seen enough Guiliani on the TV set lately. I'm another who thought that this is a bad NA launch date for a flight game... Especially considering it's the tenth anniversary, I mean if it were not a round number I would probably not be so surprised. But yeah, really should have thought this one through better, imo. Release it a week before or after, or hell, in the middle of the week even, not that game releases are ever in the middle of the week. But still. Duh, Nintendo. EDIT: Anyway I'm not going to get this one, I've never liked Star Fox. Goes back to when I was a kid and I was just absolutely terrible at it I think. I actually was given the SNES version free a few years ago and still had so much bad feeling that I almost turned it down. For free! So yeah. I'm glad for everybody who is excited, though, I certainly feel the same way about OoT and last night's release of Link's Awakening. Which I need to get back to, 'scuse me. Why would you need to see your opponent's reaction with local multiplayer? this would be more usefull in wifi connection, but for this? you can see their reaction from accross the room. But yeah, that trailer was one of the more impressive ones in 3D. Hopefully it'll leave Star Fox fans satisfied. Lol, nothing wrong with releasing a harmless game on 9/11. People are too sensitive. Does it really matter? No. Hearing an old guy say, "Do a barrel roll! ", or any of Peppy's lines just sounds so funny to hear. Edit: I know some ppl might not think too fondly of the release date. This makes me think of how in the Mega Man timeline, the events of MMX(the day of sigma) took place July 4th, but here in the States it was changed to June 4th. Just something to think about. I wonder how much they paid those people to smile after being blown up? XD I sure as heck wouldnt be smiling about that! 3DS is looking so dry this Summer.. Just Zelda in June.. Which I've played to death so I don't think it will tide me over. Never thought I could be so meh about a StarFox game, but it happened. It's just I played it too much back in the N64 days and even spent a considerable time with the VC release. PASS. @40: There's still RE:Mercs 3D.